The US is getting healthier overall, but in 21 states death rates increased for people aged 20 to 55 from 1990 to 2016. That's according to the latest results from the Global Burden of Disease Study, which has tracked health outcomes in the US and around the world since 1990. The increase in deaths for young and middle aged people is being driven by drug and alcohol use, suicide, and kidney disease, among other related factors. The opioid crisis, alcohol use, suicide, and factors like chronic kidney disease are increasing the likelihood that some Americans will die an early death. In 21 US states, the chances that someone will die between ages 20 and 55 actually increased between 1990 and 2016, according to a study newly published in the Journal of the American Medical Association. This data comes from the ongoing Global Burden of Disease Study, which has tracked health outcomes in the US and around the world since 1990. Over that time in five states - Kentucky, Oklahoma, New Mexico, West Virginia, and Wyoming - the chances people aged 20 to 55 would die increased by 10% or more. In the US in general, there's a pretty extreme disparity of health outcomes that can be observed based on where a person in born. People born in certain states are much more likely to die an early death and to live fewer healthy years when compared to people born in healthier states. At birth, a child born in Mississippi in 2016 had a life expectancy of 74.7 years. That's 6.6 fewer years than a child born that same year in Hawaii, who could be expected to live to 81.3, according to the study. On a county level, these distinctions are even more stark. A study published last year found a more than 20-year difference in life expectancy when comparing kids born in Summit County, Colorado (2014 life expectancy of 86.83) to those born in Oglala Lakota County, South Dakota (2014 life expectancy approximately 66.7). But the increasing rates of death at a young age in 21 states are particularly concerning, as they are largely due to preventable factors like drug or alcohol use, suicide, or kidney disease (which may be related to drug or alcohol use). The following chart shows the US states, with those where people are most likely to die between ages 20 and 50 at the top. For each state, you can see how much the chances people would die early have dropped on the left side of the dotted line. On the right side of the dotted line, you can see how much the chances people could die early have increased. In each case, color coding shows what's behind the increases and decreases. In some states, there has been a significant improvement in the death rate for young and middle-aged people, with the biggest improvements seen in New York and California. In total, 15 states saw improvements by 10% or more, mostly due to declining death rates from HIV/AIDS, road injuries, and related to tumors. In general, the largest risk factors for death in the US are poor diet, tobacco use, high blood pressure, obesity, and high blood sugar. 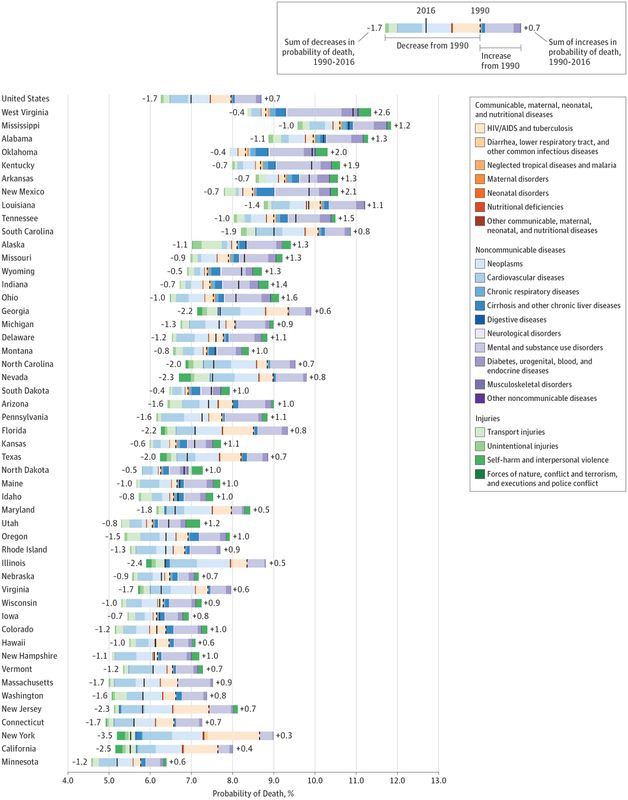 As the researchers wrote in the study, the US overall is healthier than in 1990. But the country spends more on healthcare than any other country and still ranks 43rd in global life expectancy. And even as there have been improvements, there are also factors that are causing some states to fall further behind. As physicians Dr. Howard Koh and Dr. Anand Parekh wrote in an editorial published in JAMA along with the new study, "[m]uch unfinished business faces the nation collectively and at the state level."